Along with Bob Marley, Desmond Dekker, who was orphaned as a teenager in the 1950s, has spread Jamaica's musical heartbeat further than just about anyone. The former apprentice welder was the first to have hit records outside of Jamaica and his influence on young white British teenagers was pivotal to his success in the 1960s. Desmond Dekker first recorded in 1963 he had his debut hit four years later with 007 (Shanty Town) which featured on his first album of the same name ­– it is rightly regarded as a classic and is in both the Grammy and Rock and Roll Hall of Fame. He followed it with another classic – The Israelites – which topped the charts in a number of countries, including the U.K., as well as making the Top 10 in America. The follow-up, It Miek, did well in Britain but not in America. The following year Dekker had a small American hit with his version of Jimmy Cliff's You Can Get it If You Really Want; the song got to No.2 in the U.K.. Having released many fine singles during the 1960s and 1970s Dekker's career had a boost as the eighties dawned with the arrival of the 2 Tone movement that revered the Jamaican's work. The man who helped to define Ska, Rocksteady, and Reggae passed away in May 2006, at his home in London. Born Desmond Dacres in Kingston, Jamaica, on July 16, 1942, the star-to-be was orphaned in his teens. Left to earn a living on his own, he apprenticed as a welder. It was his workmates who first noted his vocal talents, as the youngster sang around the workshop. With their encouragement, in 1961 the young man decided to have a go at recording and auditioned for both Coxsone Dodd at Studio One and Duke Reid at Treasure Isle. Neither man found anything remarkable about this young hopeful and sent him on his way. Not discouraged, Dacres next tried his luck with Leslie Kong, owner of the Beverley's label. He auditioned before the stable's biggest hitmaker, Derrick Morgan, who immediately spotted the young man's potential. However, it was to be two long years before Kong finally took him into the studio, waiting patiently for him to compose a song worthy of recording. In 1963, Dacres presented Kong with "Honour Your Father and Mother," and the producer knew the wait had been worth it. Upon its release, the song's heartfelt message soared to the top of the Jamaican charts. Having been renamed Desmond Dekker, the new star followed up with "Sinners Come Home" and "Labour for Learning," which were also successful. However, it was with his next release, "King of Ska," that Dekker's star was truly established. Backed by the Cherrypies, aka the Maytals, the boastful song, a raucous celebration of ska in all its glory, swiftly attained classic status and remains one of the genre's masterpieces. Before the year was out, Dekker had found his own backing group, the Aces, a quartet of singing siblings – Carl, Clive, Barry, and Patrick Howard – initially known as the Four Aces. Together the five men cut a slew of excellent ska-fired singles, such as the jubilant "Get Up Edina," the advice to "Parents," the bouncy love letter "This Woman," and the sublime "Mount Zion." All were big hits. However, as can be seen by the titles, Dekker's initial appeal was as a respectful young man (admittedly with a penchant for admonishing misbehaving young ladies). That would all change in 1967. Derrick Morgan helped set the stage with his trio of rudeboys-go-to-court songs beginning off with "Tougher Than Tough," which featured Dekker and his brother George on backing vocals. Wisely, Dekker himself steered clear of what swiftly turned into a judicial soap opera, instead he rocketed "0.0.7. (Shanty Town)" into the Jamaican charts. Set to a sturdy rocksteady beat, the song quickly became a rudeboy anthem and established Dekker as a virtual rudeboy icon. Across the water in Britain in the wake of its own mod revolution, the Jamaican singer was seen as one of the mod's own. The single looted and shot its way into the U.K. Top 15, and Dekker immediately set off on his first visit to England. The response there astonished him, and he was trailed everywhere by mods almost acting as informal bodyguards. More rudeboy hits followed, including the indeed soulful "Rudy Got Soul and "Rude Boy Train." Others were often in keeping with the more temperate subjects of Dekker's past: the religious-themed "Wise Man," "Hey Grandma," the warning for "Mother's Young Girl," the lovelorn "Sabotage," the bouncy "It's a Shame" (wherein another girl gets a telling off), and the inspirational "Unity" (which took second place at Jamaica's Festival Song Competition that year). One of the most evocative was "Pretty Africa"; one of the earliest repatriation songs composed, it's haunting beauty and yearning quality has kept it a strong favorite. "It Pays," another hit from 1967, features some of the most exquisite falsetto harmonies ever to be recorded and showcases the Aces as their best. Although none repeated the success of "0.0.7.," Dekker remained a powerful force in the U.K. and a superstar at home. Many of the hits from this era were included on the singer's debut album, which was naturally titled after "0.0.7. (Shanty Town)." In 1968, the singer unleashed the mighty sufferers' lament "Israelites" on an unsuspecting world. For half a year, the song simmered on the U.K. charts, finally coming to a boil in March, when it topped the chart. Meanwhile in the U.S., the song had also begun to rise, peaking thee months later just inside the Top Ten. Dekker had achieved the dream of every Jamaican artist, to break into the U.S. market. He was the first to do so, at least with a pure Jamaican song. Although Dekker would never put another single so high into the U.S. charts, his career continued unabated both at home and in the U.K. The heartbreak of "Beautiful and Dangerous" was the perfect theme for another smash, as was the exuberant "Shing a Ling" and the equally infectious "Music Like Dirt." For the more religiously minded there was "Writing on the Wall," but what did buyers of that popular single make of the highly suggestive and equally successful "Bongo Girl"? Before the year was out, the Beverley's label gathered up a group of hits from the year for the Action! collection. In 1969, the upbeat "Problems" spoke directly to the Jamaican public, who bought the single in droves. But the year was defined by "It Mek," wherein another girl gets her comeuppance. Dekker composed the song about his rambunctious younger sister. Initially released to muted response, the original was a charmer but lacked punch; the re-recorded version was much stronger and smashed into the Jamaican chart, then soared into the Top Ten across the water. "Pickney Gal," however, although very successful in Jamaica, did less well in the U.K. As to be expected, Beverley's rounded up this year's hits for a new album, Israelites. In the U.K., fans were treated to This Is Desmond Dekker, which the Trojan label also released in 1969, a virtual nonstop chart-busting party, drawn from the three Beverley's sets. By the time the '70s dawned, Dekker had relocated to Britain and was spending most of his time touring. However, he continued releasing excellent singles, as always backed by the superb Beverley's All Stars house band and accompanied by the exquisite Aces. Neither the band nor singers have ever received the credit they were due. The former's flawless and sympathetic performances powered every one of Dekker's songs, while the latter's sublime soaring vocals and perfect harmonies helped define his sound. Unusually, Dekker's next hit would not come from his own pen, but another's. Leslie Kong had to argue vociferously to convince the singer to cover Jimmy Cliff's "You Can Get It If You Really Want," but in the end, Dekker put his faith in the producer. He was rewarded with a timeless masterpiece that was a smash on both sides of the Atlantic. The song titled yet another hit-laden collection, released by Trojan in 1970 as well. In retrospect, it was fitting that Kong's two greatest stars should have combined talents in this way. In August 1971, the great producer, still only in his thirties, died unexpectedly of a heart attack. Unlike virtually every other artist on the island, Dekker had spent his entire career under Kong's wing and was devastated by his death. (Barring a few very early recordings, Cliff had as well and was equally distraught and directionless in the aftermath.) 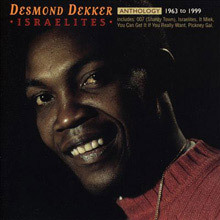 The definitive collection of Dekker's work with Kong is found on the Trojan label's Original Reggae Hitsound of Desmond Dekker and the Aces compilation. Initially at a total loss of how to now proceed, eventually Dekker found his way, and over the next few years, he released a steady stream of fine singles. However, he seemed to have lost his grip on Britain and none of his releases charted there. In hopes of remedying this situation, in 1974 Dekker joined forces with the pop production team Bruce Anthony (aka Tony Cousins) and Bruce White. Their session together resulted in the singles "Everybody Join Hands" and "Busted Lad," released in the U.K. by the Rhino label. They had little impact however, but in 1975, another song from the session, "Sing a Little Song," charmed its way into the British Top 20. A sugary offering with lush production, it was far removed from the work Dekker had done with Kong. A new album, titled Israelites, and not to be confused with the Beverley's album of the same name, was also released this year. Although it featured a ferocious version of the title track, it then sank quickly into syrupy waters, much like "Sing..." After that and for the next five years, Dekker disappeared off the U.K. radar almost entirely. He continued to release records in Jamaica, although they were sporadic in comparison to his prolific output in the '60s. However, as the '70s came to a close, the 2-Tone movement gave fresh impetus to the singer's career, and Dekker inked a deal with the independent punk label Stiff. His debut for them was the wittily titled Black & Dekker album, which featured re-recordings of past hits, backed by the British rock band the Rumour. the Rumour, of course, were famous as the group behind Graham Parker. A series of singles also announced his return, with the first, a re-recorded "Israelites," almost breaking into the Top Ten in Belgium. That was followed by "Please Don't Bend" and a cover of Jimmy Cliff's "Many Rivers to Cross." A fourth single, "Book of Rules," was especially strong and produced by Will Birch, best known for his work with power pop bands. Dekker's follow-up, 1981's Compass Point, in contrast, featured mostly new compositions and was produced by Robert Palmer. Both it and the single "Hot City," however, did poorly. Regardless, Dekker was in big demand on-stage, where he continued to be accompanied by the Rumour. As the 2-Tone movement disintegrated, so too did Dekker's revival. In 1984, the singer was forced to declare bankruptcy, although this was less a reflection on him than on his past management. Dekker veritably disappeared from view for the rest of the decade, with only Trojan's 1987 Officially Live and Rare album breaking the drought, which was recorded during an enthusiastic live club appearance in London. A new version of "Israelites," utilized in a Maxell tape ad, brought the singer back into public view in 1990. The following year, Dekker released King of Ska, again featuring re-recordings of past glories. Two years later, he entered the studio with an equally revitalized Specials for the King of Kings album. And although this set too featured old hits, this time around the vast majority weren't Dekker's own, but his personal heroes, including, of course, Derrick Morgan, the man who had discovered him. In 1996, Moving On appeared, not one of Dekker's best. However, the Trojan label has continued to keep the singer's back catalog to the fore. Beginning back in 1974, when they released the humorously titled Double Dekker, across Sweet 16 Hits (1978), The Original Reggae Hitsound in 1985, and 1992's Music Like Dirt, there's never been a dearth of excellent Dekker material for fans to revel in. Other labels have jumped in on the action, and the shelves have quickly filled with compilations of the singer from varying stages of his career. Dekker's vast catalog of music, songs that defined the ska, rocksteady, and reggae eras have provided the singer with a rich legacy that has rarely been equaled. On May 25, 2006, Dekker passed away at age 64 in his London home. 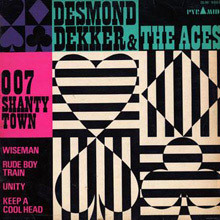 Desmond Dekker first recorded in 1963, but he had his debut hit four years later with 007 (Shanty Town) which featured on his first album of the same name – it is rightly regarded as a classic and is in both the Grammy and Rock and Roll Hall of Fame. 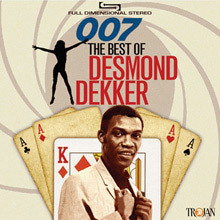 007: The Best Of Desmond Dekker is a compilation album by Jamaican reggae artist Desmond Dekker named after his debut 1967 hit 007 (Shanty Town) which featured on his first album of the same name. Most people over the age of 45 remember "Israelites," the international hit single that made Desmond Dekker a household name in the 1960s and gave the U.S. its first taste of Jamaican ska. Your average old school ska fan has worn out more than one copy of "Honour Your Mother and Your Father," "007 (Shanty Town)," and "Pickney Gal." But beyond those familiar tunes, most of Dekker's catalog is pretty obscure. This generous mid-priced two-fer won't satisfy completists (inexplicably, such gems as "Keep a Cool Head" and "Rude Boy Train" are missing), but its 50 tracks will probably be enough for most ska lovers. It includes obvious faves like "Israelites" and "007 (Shanty Town)," two versions of the chart-topping "It Mek," and, toward the end, a charming set of 1990s remakes that finds Dekker still in excellent voice - his new renditions of "King of Ska," "This Woman," and "Young Generation" stand up remarkably well to the original versions, and there is also a very fun ska arrangement of the calypso chestnut "Jamaica Farewell." The occasional clunker notwithstanding, this set can be considered essential. 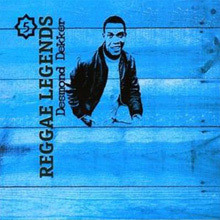 Desmond Dekker has been well served by the reissue labels, with the shelves buckling under all the compilations dedicated to his music. The bulk, however, invariably draw from the same limited pool of songs, with most ignoring the singer's early years entirely. The two-CD You Can Get It If You Really Want: The Definitive Collection is pretty much the only compilation that provides a proper career retrospective, with the rest drawing exclusively from his 1967-1971 recordings. 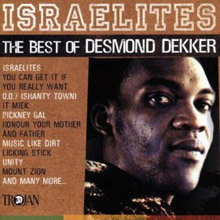 Israelites: The Best of Desmond Dekker, while no substitute for You Can Get It If You Really Want, at least dips back into Dekker's early years. One of the best one-disc roundups around, the compilation top-loads the set with Dekker's international hits (the only one missing is 1975's "Sing a Little Song"), with the other 20 tracks drawn willy-nilly from the Kong years (1963-1971). There's no attempt at chronology -- and ska numbers rub shoulders with reggae tracks -- nor any sense of sequencing, so the tempos and moods shift dramatically at times. By and large, though, the set will sate most casual Dekker collectors, with the selector having worked hard to include most modern-day fans' favorite numbers. Those looking for more should purchase You Can Get It If You Really Want, but for those seeking just the hits and a decent overview, this set is the perfect solution. Desmond Dekker's greatest records are collected together here on this collection. From his first UK hit single, 007 (Shanty Town), through his No.1 Israelites to It Mek and the outstanding, King of Ska. It's a great album to get acquainted with one of Jamaica's outstanding singers. 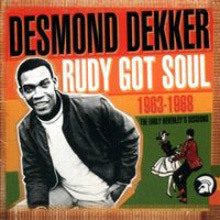 Rudy Got Soul: The Complete Early Years 1963-1968 chronicles Desmond Dekker's first single from 1963, "Honour Your Father and Mother," through his enormously successful Jamaican hits recorded in the mid- to late '60s with the Aces. The disc highlights the outset of rocksteady with the tracks "Hey Grandma," "Music Like Dirt," "Rudie Got Soul," "Sabotage," "Rude Boy Train," and the James Bond-inspired "007." These are the tracks that initially made him a star in Jamaica, then the U.K., and finally emerging as an internationally celebrated artist who hit it big in the U.S. with the Israelites in 1969. Highly recommended.